Completely redesigned from the ground up, premises installations will never be the same. Designed with the technician in mind, the Infinity Premise Enclosures reduce installation time and have uniquely designed features to keep every enclosure installation neat and clean. Throw out the old and welcome the new Infinity Premise Enclosure. The Quick Mount Rail allows any True Flex product to be snapped into the enclosure quickly and easily without the use of screws or hardware. Stop "screwing" around and dramatically reduce installation time. Easy. Horizontal and vertical bosses take the guess work out of product installation. If you are using screws to mount hardware, Continuous Bosses give you the flexibility of choice and help decrease installation time and increase reliability. Smart. 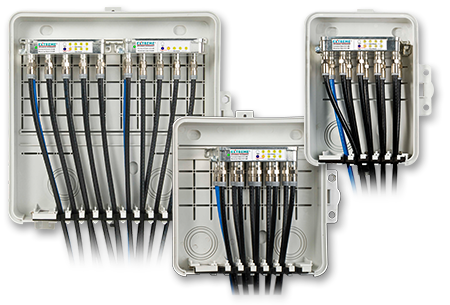 Quoted as "The best thing since sliced bread", cable retention slots simplify enclosure installations by allowing installers to work outside of the box. Installations and service calls have never been quicker. Enjoy. Don't be afraid to show off your new enclosure. With a sleek low profile design, full color labeling has never looked this beautiful! Rain or shine, snow, sleet, hail, or wind, the Infinity Premise Enclosure is designed with UV rated thermo plastic alloy to withstand the elements day in and day out. Tough enough for the installer, pretty enough the customer.